The third day of play at the PokerStars European Poker Tour Berlin €5,000 no-limit hold’em main event has ended with 24 players. Action was brisk to start the day thanks to the fact that the field played into the money late yesterday, so the field shrunk down to the prescribed goal of 24 quickly. Those survivors will return tomorrow and play down to the final table of eight. The chip leader at the end of the night on day 3 was Kevin MacPhee (pictured left), who ends the night with 2,526,000. Right behind him is Theo Jorgensen with 2,408,000. The chip leader from yesterday, Stefan Huber, had another strong day and finished in fifth chip-position with 1,850,000. Other notables that have made it this far include Team PokerStars pros Johannes Strassmann (515,000), and Jude Ainsworth (539,000), as well as Joao Barbosa (794,000). 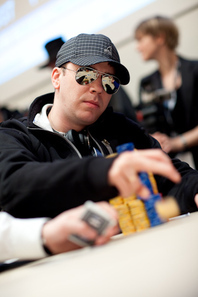 Gross was eliminated on the hand and MacPhee grew his chip stack toward 2.5 million near the end of the night.